I *think* those were her scores. Overall it was a good meet for E1. She got totally hosed on her bar score - it wasn't an Olympic routine but it was as good as the routines that scored 8.65 & 8.90. The best thing about the meet was that she stayed on the beam! Note: E1 has three more Level 6 meets and will not compete Level 7 until January. E1 has all her level 6 and 7 skills, AND the head coach told her group that it is time to come up with a list of songs they would like to be considered for their level 7 floor routine! SQUEEEEEEEE! E1 had a fun week at senior camp, although this year she did not feel like she got to work on upskills very much (skills above her current level). So that was a little disappointing. It also seems like the price of camp goes up a little each year (or at least does not go down) but they continue to cut things out. E1's first year they got to go to a pool and Magic Mountain and her second year they did a ropes course at Camp Mary Orton. 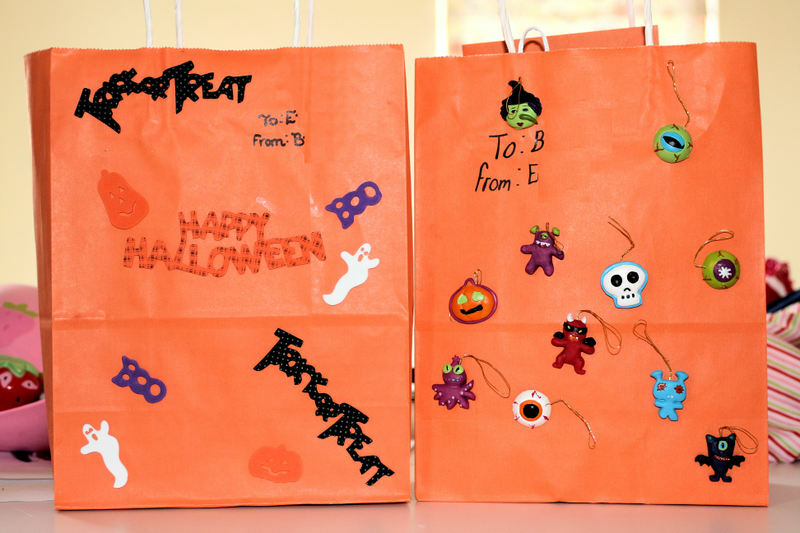 This year (her fourth) they didn't even do any crafts. Again, E1 had fun so I guess that is what really matters. I will admit that I am a little burnt out on kid sports. Sometimes the financial & time commitment are draining but usually I am okay with those (or just shove them back into the deep recesses of my mind and don't acknowledge them!). The mind numbing soul sucking parts are slimy coaches ( not at gymnastics), rabid "MY KID IS THE BEST EVER AT THIS SPORT!! parents, fake phony leeches, tween girl drama (man am I sick of E1's complaints in this area! whether it is her perception or she really is dealing with some divas I just. want. it. to. stop. ) and on and on and on. #1 All-Around with a 36.875! No matter what, she is TOPs with me! E1 had a GREAT practice today! She made her back walkover on the high beam (and got to ring the bell), did an aerial, and got to ring the bell for her Yurchenko drill. She has been scared. to. death. to do the walkover so today was HUGE! E1 and E2 had a ton of fun at a birthday party at their gym today. Z had a blast playing paintball yesterday! The team voted on MVP and he did not win, but he did get 5 (of 12) votes so that was nice! Yummy meals and family time this week at Cracker Barrel, Buffalo Wild Wings and the Rusty Bucket. Z had a big math project/presentation due this week and got 100 pts out of 100! Hot Fuzz - what a funny movie! eta: E1 really enjoyed her field trip to the Ohio Caverns - although I think the highlight was the mood ring (lost this weekend in a porta potty tragedy) she bought at the gift shop! The good news is that E1 did a back walkover on the high beam. The bad news is that attempt 2 was not quite as successful. Final Level 4 Meet aka State Championships aka 38! and 2nd????? AA: 38. And. came. in. SECOND! First place got a 38.15. Oh well. State Champ would have been a great way to end the level but what can ya do? She is Bars State Champ, and received her highest bar and vault scores ever. E1 and I were there from noon until 10pm. 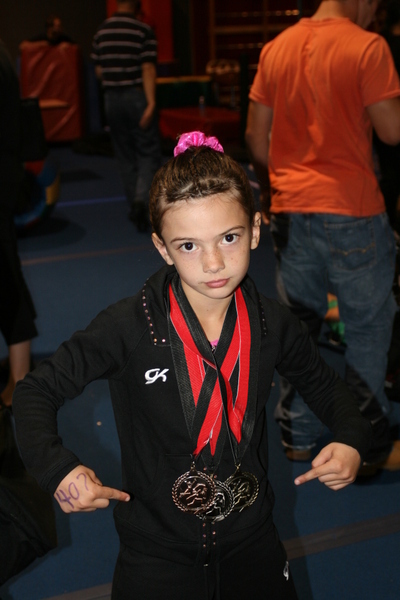 We stayed to watch one of her teammates and to find out if her gym took first place. It did! The girls were SO happy and E1 got to bring the trophy home for the night! It was a very long day, but very fun! What's the opposite of ni hao? One of E1's coaches is going back to China after State Meet, so last night we did a few group photos with her. We'll have all the girls sign the photo's mat, frame it, and give it to her at State. Today's gripe: What is wrong with teh internets/our computer/our internet service provider? I have had SO much trouble accessing twitter, facebook and typepad today. Probably a sign to get off the computer and do laundry! 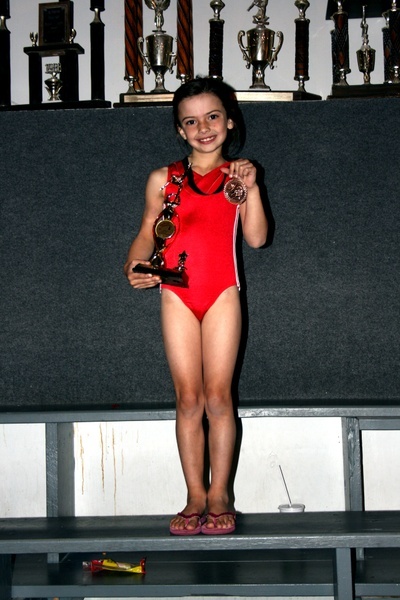 SO glad I ordered the photo cd from E1's big meet - so nice to have decent gymnastics photos for a change!! Not bad for a little girl who was a. very stressed about this meet (our gym hosts it, there are three gyms going on at once, lots of people, lots of noise, etc) and b. is now pukey sick. Poor Puma. 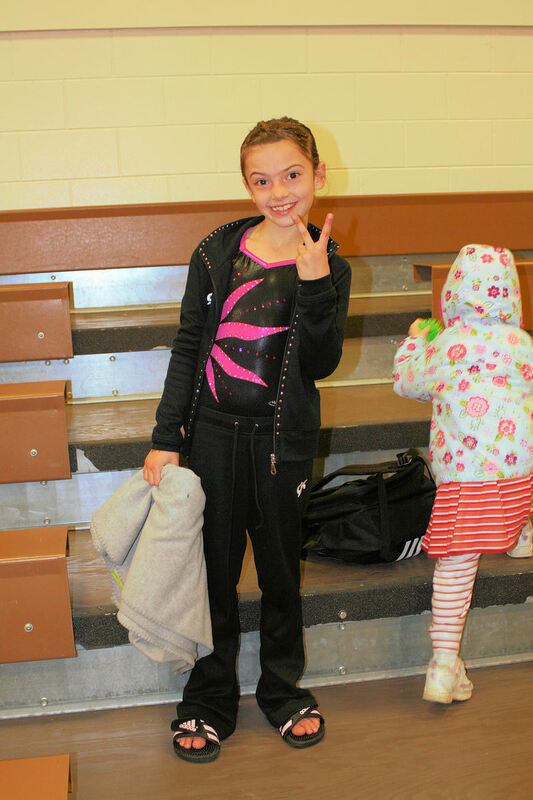 There were approximately 400 gymnasts at the meet this past weekend, from Level 4 -10. There were only two scores above 9.7, one of which was E1's 9.7 floor score. There were only 15 scores between 9.5 and 9.599, two of which were E1's 9.5 vault and 9.55 bars scores. There were only 11 all-around scores above 37, one of which was E1's 38.15 score. 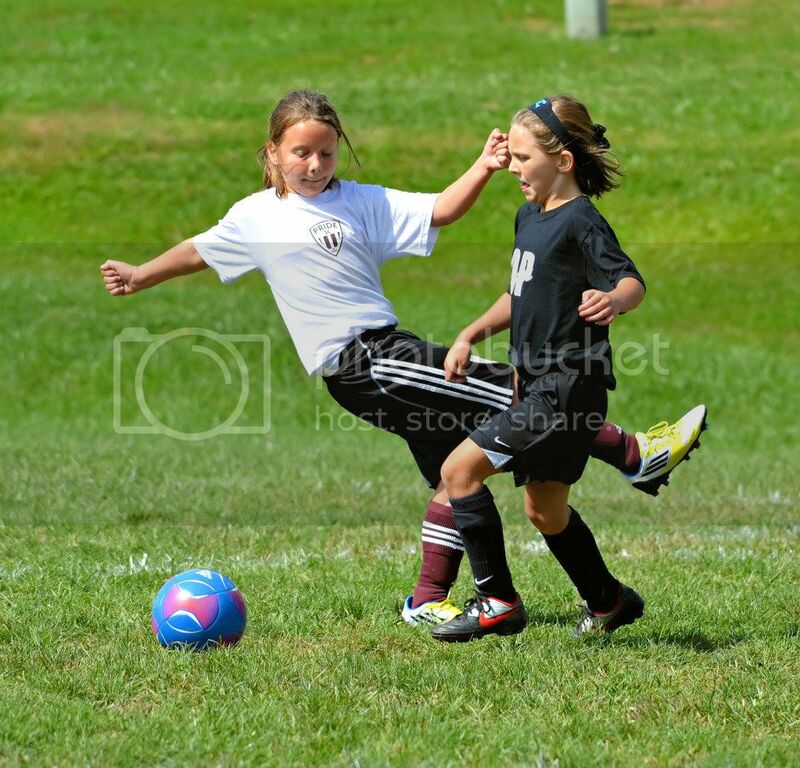 E1 got a great big sis this season. 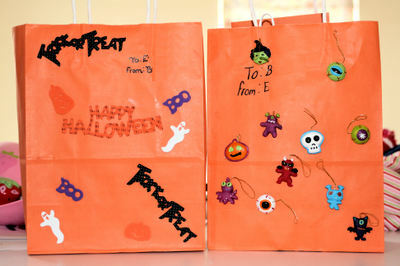 B is very encouraging and has given E1 several cards and little gifties. 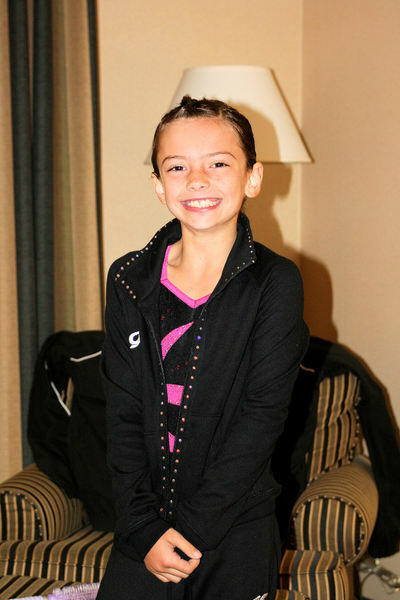 E1 really looks up to her - B is an elite gymnast who is also an excellent student and is very sweet. E1's first meet is Saturday @ 4:30! Here we go again! She'll have to score nines if she wants to continue working on the higher level skills. I hope that gives her some incentive. Z was in a goofy mood this morning that was not conducive to picture-taking. E1 made her backhandspring on the low beam last night!